KUNC film critic Howie Movshovitz has more on Budapest Noir and The Interpreter. Right off the bat, Budapest Noir looks like a descendant of the great American noir films from the 1940s and ‘50s. This film’s in color, but otherwise it starts like a typical noir – a lonely, haggard guy walks down a wet cobblestone city street at night. He’s backed by the sound of a trumpet that’s as lonely as he is. He’s a reporter, and there’s been a murder. The victim may have been a prostitute, and the reporter, Zsigmond, wonders why no one seems inclined to investigate. So, of course, he does. His only ally – noir style – is the rumpled guy who sells cigarettes late at night from a tiny, suitably grimy hole-in-the-wall shop. Lots of films try to imitate American film noir, but most of them stop at the clichés – exaggerated devious women, a superficially grubby lead man, a brutal world confusing for no reason. Actual noir, though, was usually based on something back in the past that no one wants to acknowledge, and that’s what’s causes the disturbance in the world. In those American pictures, the unmentioned past was World War II, and the men who fought in that war are vulnerable and shaken. Now we call that state PTSD. For Budapest Noir, the back there is the present, and it’s potent. The time is 1936, with fascism and anti-Semitism rising in Hungary, and Hitler is not considered a bad guy. The dead woman was Jewish, and this was not a simple murder, if there is ever such a thing. Budapest Noir has a restlessness inside it; it doesn’t just rework old film noir. It’s interested in the present in another way – which is our now. Fascism and anti-Semitism are again rising in Hungary, and Budapest Noir looks right at it. The Interpreter looks at the present also, but from another direction, the problem of memory. How do we deal with the Shoah, or the Holocaust now, those events that took place in the 1940s, which are as important as ever and still have to be understood again and again. Ali Ungár, an 80-year old Jewish man from Slovakia, with a gun in his pocket, knocks on an apartment door in Vienna. He’s learned that the former SS officer who lives here murdered his parents during the war. A 70-year old retired teacher, Georg Graubner, answers the door and tells the older man that his father is long dead. 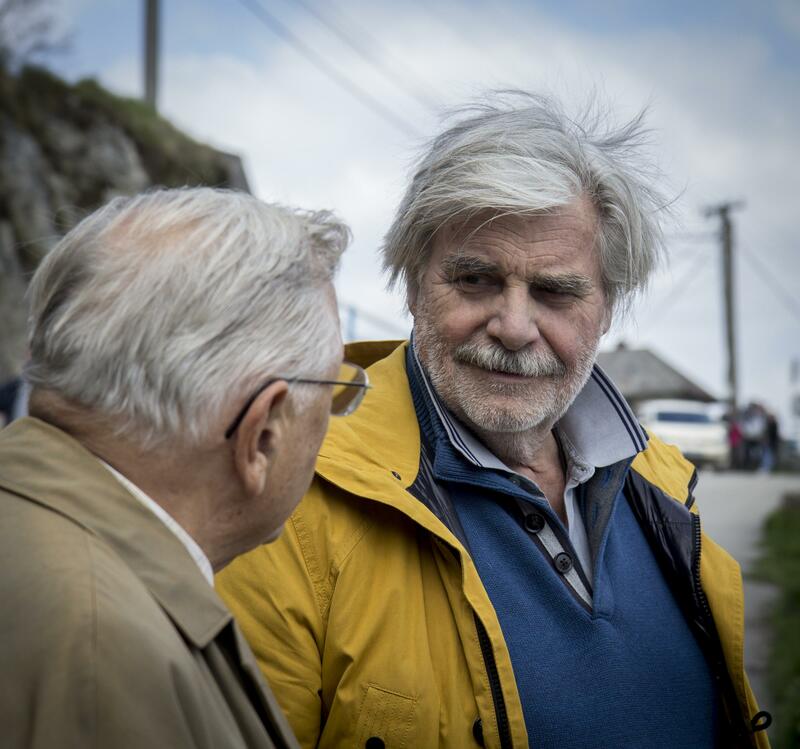 And after a few strange and awkward moments, the 70-year old asks the older man to travel back to Slovakia with him as his interpreter – he wants to learn about his father. You know something is wacky when the two guys drive off in a hot pink Mercedes, and from there The Interpreter is an unexpected, unpredictable mix of the comic and the dead serious. There’s no comedy – there’s nothing funny – about the extermination of 10 million people, but there is an absurdity that’s often funny about these two men together searching for information. Along their way, the two wind up in a hunting camp; they must share a bed; they dance at the wedding of people they don’t know, and they confront their histories. In one of the crucial exchanges of the film, the son of the SS man asks Ungár’s daughter if it’s worse to be the son of the murderer or the son of the victims. What could be the answer to such a question? But The Interpreter makes it and the story of the Holocaust crucial for right now. Two extraordinary actors lead this stunning movie – as the younger man, Peter Simonischek, who played the lead in the remarkable Toni Erdmann, and as the older man Jiri Menzel, the great director of Closely Watched Trains. The International Film Series on the CU-Boulder campus first put films on screen in 1941. That was the year of Orson Welles astonishing first film Citizen Kane, the great Preston Sturges’s comedy Sullivan’s Travels and French director Jean Renoir’s first American film Swamp Water, made in the U.S. because he’d fled the Nazi occupation of France. The British seem to have an inexhaustible supply of bloody royals and old castles to exploit, and Americans at least have an appetite to match. In just the last couple of months, The Favourite brought us a grim and intimate view of the 18th century Queen Anne, and now comes a grim and intimate view from the 16th century, of Mary (Saoirse Ronan) in Scotland and Elizabeth I (Margot Robbie) in England.